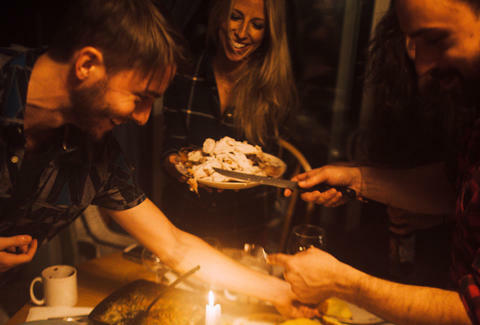 More than just Thanksgiving with friends, Friendsgiving is a celebration of eating, drinking, and all the memories you’ve shared -- good, bad, and downright embarrassing. Whether you celebrate it the Thursday of Thanksgiving, the Wednesday before, or the weekend after (because everyone seems to do it differently), one thing should ring true for all Friendsgivings: it should be unbelievably fun -- and not your mom’s Thanksgiving. We came up with 14 ways to upgrade Friendsgiving and make it one you’ll be talking about for years to come. Aside from dry Turkey, there’s pretty much nothing worse than being forced to listen to music you can’t stand. “You just gotta hear this one,” your friend says. “Seriously, man, you’re gonna love this dude. This song jams!” No thanks. It’s actually really easy to please everyone with this one. Create a playlist on Spotify earlier in the week and name it something like “Turkey Jamz,” or “Friendsgiving 2k16,” then share the link with everyone via email or group text. Everyone can add their favorite new hits, and even throwbacks that remind you of Friendsgivings past. Shuffle it up and just wait till Chumbawumba’s “Tubthumping” plays. Now that song jams. Must we see the same “cute” and “clever” place cards every year? Names written in cursive stuck on a toothpick stuck in a wine cork are precious... and totally overdone. Try assigning everyone a moment in pop culture or a meme. 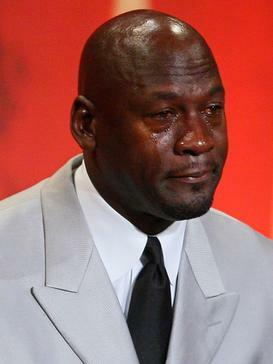 Josh can be Crying Jordan. Britney is clearly Phelps Face. And Dan? It’s obvious. Damn, Daniel. Back at it again with the cranberry sauce. Now, stick those on a toothpick and stick them in wine cork and those are place cards we can get behind. For dessert, try a Bourbon Apple Spice Martini, a simple mix of bourbon, apple cider, and cinnamon. The spices fit with the flavors of autumn baked goods and Thanksgiving pies (apple, pumpkin, pecan, etc.). “Pro tip: Keep this on the stove simmering through the evening and it’ll flavor the air in the whole house with a delicious smell,” he says. “When it’s time to serve, just add a shot of the alcohol to a punch cup and ladle it out with dessert.” But don’t add the alcohol before, as it’ll burn right off on the stove. Creating a signature drink makes the night special and helps honor the friendship you’ve all gotten together to celebrate. Create a one-of-a-kind cocktail and name it after a bar you all frequent, or even one of your friends, like Mike, AKA Big Bowser. Remember that time he thought it’d be cool to spit whiskey in the air and fire a blowtorch at the same time? Sure, he resembled the fire-breathing Super Mario Bros. villain more than anyone you’ve ever seen, but it took literally months for your eyebrows to grow back. But, hey, now that you can finally laugh about it -- something your pals have been doing for years -- mix up a few Big Bowsers and do just that. Fireball would be perfect for a drink like this, so get some inspiration from these seven cocktails. You could try a Chai Fireball Tea (which is basically a hot toddy with those two ingredients) or an Apple Pie on the Rocks using vanilla vodka, apple juice, cinnamon, brown sugar, and the candy-tasting whiskey. Of course, these are just for inspiration. Make sure you come up with something that encapsulates your group’s own Big Bowser, or whatever his nickname may be, in all his glory. So there you are: Your turkey is ready on time (magically), the hors d’oeuvres are cut up and assembled on the coffee table (adorably), and your friends are late as ever (unsurprisingly). This is why you need valet parking. Your friends will feel like royalty when they show up and someone asks, “May I park your car?” If you live in a crowded neighborhood or you’re sans driveway, this is the perfect way to elevate the evening and make it classy. Since everyone at Friendsgiving usually has a job anyway -- like clearing the table or drying dishes -- designate one friend to be the valet. Or even hire your neighbor’s (responsible!) teen and toss him a few bills and a plate of leftovers. This way, everyone’s food stays hot, everyone’s on time, and no one’s cranky from missing out on a great spot. 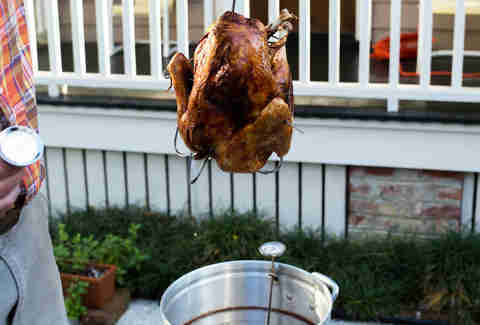 At minimum, it takes three hours to roast a turkey -- if it’s a small bird. That’s also if you don’t include stuffing, and what kind of monster doesn’t include stuffing? BUT if you deep fry it in peanut oil, it takes -- get ready for this -- just three minutes per pound plus an additional five minutes per bird. So let’s say your Friendsgiving turkey is 24 pounds. You could roast it for, like, five hours, or you could deep fry it for 77 minutes. No contest. You could also make a beer can turkey by... doing exactly what you think. Put the beer can in the seasoned bird and throw it on the grill for an hour. Or, you could spatchcock it. That’s when you split the bird in half and cook it flat on the grill or in the oven. It’s juicier, crispier, and cooks in half the time, leaving you free to do what really matters: make dessert... we mean, spend time with loved ones. But if all else fails, just go full monty and make a Turducken: a chicken stuffed in a duck stuffed in a turkey, of course. Regular Thanksgiving is meant for regular Thanksgiving side dishes. You got your delish (but boring) mashed potatoes, your roasted brussels sprouts or asparagus, blah, blah, yawn. Friendsgiving is cooler than that, so pull out all the stops when it comes to the sides and try one of these game-changers. Fried Mashed Potato Gravy Bombs: You might never want to eat plain mashed potatoes again for as long as you live. Overnight, freeze some gravy in ice cube trays. Then the next day, all it takes is 35 minutes. Cut the gravy into smaller pieces, cover them fully in mashed potatoes, cream cheese, Parmesan cheese, salt and pepper, then bread and fry them. Full directions here. Bacon and Butternut Squash Risotto: Making something in a slow cooker is foolproof. Making something with bacon guarantees you’ll make everyone’s favorite dish. This recipe uses chicken broth, bacon or pancetta, butternut squash, rice, and a few other ingredients for flavor and richness. After you sear the main components in a skillet, it’s basically just two hours in the slow cooker. Full directions here. If your friends are anything like everyone in the world, they probably watch a ton of cooking competition shows. Well, now’s your chance to judge one another like you’re Gordon Ramsay. (Just be more MasterChef Junior Ramsay than Kitchen Nightmares Ramsay. Nightmares Ramsay will ruin any party game.) After the meal, have everyone anonymously write down what their favorite dish was. You get to decide what the prize is. Maybe the winner gets free drinks 'til Christmas? New Year’s Eve? Let’s just hope Britney doesn’t win. She likes the top shelf stuff. If you want to feel really flossy this Friendsgiving and not cook a darn thing, pool your funds and hire a professional chef to do it all for you. Why sweat over a hot stove when you can chat over an ice cold beverage instead? And (if you’re a subpar cook), why cry over burnt potatoes when you can catch up on life over smoked gouda? You’ll want to bring tupperware to this Friendsgiving 'cause the leftovers are gonna be a hot commodity... if there even are any. Try calling a local caterer or an event planner in your area to see who they recommend. If you’re putting in an order to be delivered, you’ll have an easier time -- but having someone come to your home takes serious planning, so put in that request as early as possible. Every Thanksgiving, your Uncle Bob sits down on the couch after his meal, unbuttons his pants, and lets out a great big sigh of relief. Those jeans, they’re so binding. You think, If I could just be comfortable then this Friendsgiving would really be one for the books. Well, why not? Who said you needed to dress up? The professional chef you may or may not hire isn’t gonna care if you’re wearing socks on your head and hats on your feet. That’s why you need a basket of sweatpants. Welcome to Friendsgiving, please take a pair of sweatpants on your way in and get COMFY because we are about to eat and chill and we will not be bound by denim, or even worse, corduroy. Whether you’re looking to get a little tipsy or just love the taste of the amazing cocktails you made, drinking games are undeniably fun. Play with soda, with seltzer. Heck, play with gravy if you’re feeling crazy. Drink every time someone says the turkey is “moist” (or “dry” if Jen made it this year. Shoulda spatchcocked it, Jen). “Straight Face”: Everyone writes down insanely inappropriate/hard-to-digest sentences on scraps of paper and puts them in bowl. Take turns trying to read them. If you can’t do it with a straight face, well, you know what happens next. “Most Likely”: This one’s perfect for people who know each other as well as you guys do. Take turns saying things like, “Most likely to cry while watching Shark Tank,” then point to whoever you think is most likely to cry when someone achieves the American dream on national television. If four people are pointing at you, take four drinks. You don’t need huge board games and pieces you’ll inevitably lose to keep the fun going. Try these simple games that any number of people can play. Celebrity: Everyone writes down names of celebrities, politicians, and famous people of all kinds (yes, even Ken Bone would count) on scraps of paper, folds them, and puts them in a bowl. Taking 60-second turns, each team has to name as many celebrities as they can by just giving clues. Whichever team has the most points when the bowl is empty is the winner. Cards Against Humanity: The “party game for horrible people” is a no-fail crowd pleaser. And, guaranteed, at least one of your friends has it. Plus, for $10, you can make your own deck and include inside jokes, friends’ names, favorite bars, and whatever else. Let your turkey-hazed imagination go crazy. 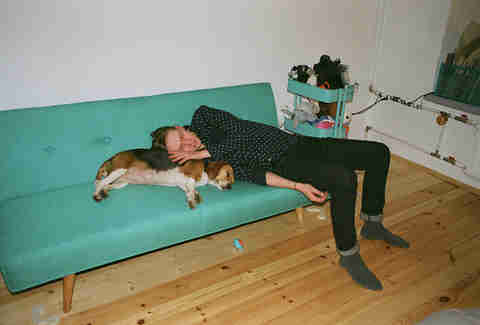 If you’re gonna hang all day and night, you’ll need a power nap (or three) -- and there’s no shame in that. Friendsgiving is a joyous time; instead of drawing on the face of the friend who passes out first, why not celebrate them and give them a comfy place to sleep off the mac-n-cheese? Set up your bedroom with blankets and pillows, and maybe even play A Charlie Brown Thanksgiving on repeat, so your friends can take a well-deserved siesta when necessary. You won’t have fun if you’re cranky and you don’t want to step over people passed out on the floor and the couch. And you know what? While we’re at it, let’s designate nap rooms at work, in doctors’ offices, and at the DMV. Listen, if pumpkin spice lattes were going to be just a trend, they would have been forgotten a long time ago, But, here we are. You just can’t beat the richness of the pumpkin combined with cinnamon combined with rainbows and hopes and dreams and babies laughing and tiny puppies with big paws and Beyoncé and everything else that’s good in the world. So this Friendsgiving, give the people what they want. Give the people pumpkin spice everything. But how? You can make this Boozy PSL with graham crackers, marshmallow fluff, milk, coffee, whipped cream vodka, and a few other ingredients or this Pumpkin Spice White Russian. For a dessert to go along with your drinks, this Pumpkin Spice Monkey Bread combines pumpkin puree, brown sugar, biscuits, toffee bits, and chopped walnuts (among other delicious things). Classic pumpkin pie is cool if you’re trying to have a Thanksgiving like every other year, but this is going to be a Friendsgiving like no other. Rebecca Strassberg is a staff writer at Thrillist who, if we’re being honest, thinks chai tea lattes are WAY better than pumpkin spice lattes. You can fight with her about it on Twitter @strassbooger.